The background of the Miniature Bull Terrier parallels that of his bigger brother - the Standard BT. At the time of its development in the 19th century, the main objective seems only to have been to breed a dog of more manageable size. A club was founded in England for the mini versions in 1938, by Colonel Glyn. Long gone are their early days when they were associated with the fighting pits, and also used for ratting. Today they are enjoyed as a delightful family companion and much of the pit behavior toward other dogs has mellowed out. Except for the difference in size, the miniature has all the personality and clownish behavior of the breed and looks like a carbon copy of the standard size dog. Friendly, affectionate, obedient and intensely loyal to their owners. They are quite fearless and make good watchdogs. They are intelligent and even-tempered, but can be a bit on the stubborn side. They thrive on interaction with their owners and need to see you as their leader. Training should be very consistent, firm and fair, including early socialization with other dogs. The Miniature Bull Terrier is happiest surrounded by family and getting lots of attention. He does not like to be left alone for hours. The short and harsh textured coat fits tightly and is glossy in appearance. It is easily maintained with weekly brushing and bathing only as needed. This is a very active breed. Significant daily exercise, on a leash, is top priority in caring for this dog. If you can't get to the dog part or when the weather doesn't cooperate or time is tight, a dog fitness treadmill is a handy alternative option to provide exercise. Miniature Bull Terriers will adapt to apartment or house. Ideally, a secured outdoor area to play is very helpful, as an addition to his regular walks. Generally expected to do well with older children. May be a little overwhelming for small children. The best policy, whenever pets and children are are interacting and no matter what the breed, is to have adult supervision in place. No more loyal dog could be found for the elderly, but the training and exercise needs may be more than desired. 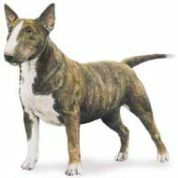 Are you the proud owner of a Miniature Bull Terrier? If you are, would you like to share your dog's story as well as your first hand experience with this fine breed. We love dog stories and dog pics, so we've made it quick and easy for you to brag about your dog with us and our visitors. You're invited to go here and get started. We can't wait to have your dog join our community! a tendency to be stubborn. - always in a fair way.